Brunch is one of those things I look forward to no matter the season. I lead a busy life, so finding time to get away isn’t easy. Any opportunity to get dressed, head out, and connect with friends over good food and drinks is always a highlight. I recently enjoyed an amazing Fall Brunch at the very chic Four Seasons’ restaurant Bar Margot with friends. 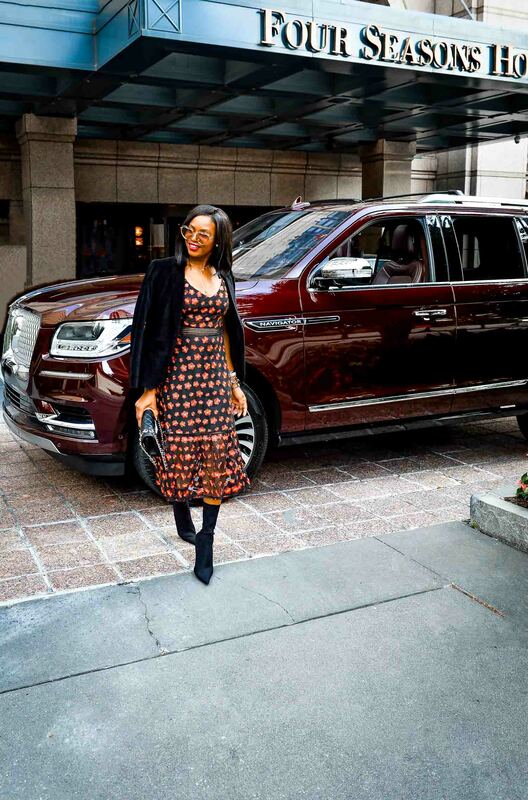 I had the pleasure of experiencing the Lincoln Navigator’s luxurious Black Label SUV that weekend, and drove the car to the venue. The car was the perfect shade of cognac, and screamed luxury. The Four Seasons and Lincoln are classic luxuries, so I knew this was going to be quite the experience. 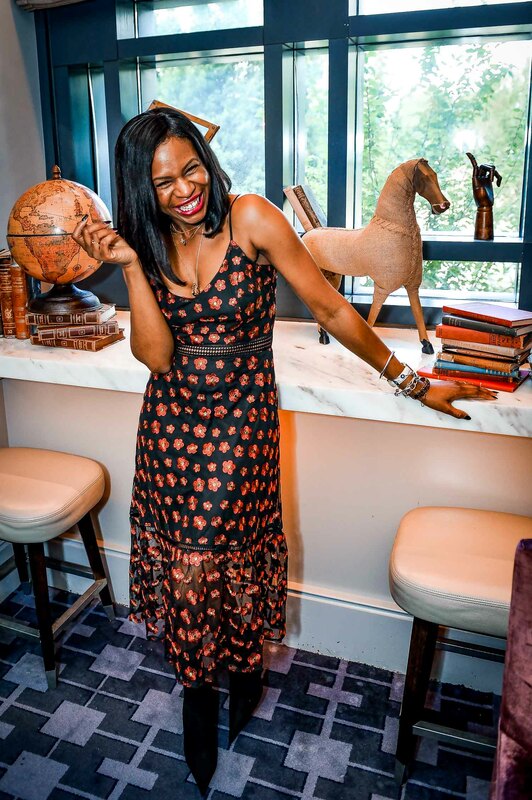 Deciding what to wear to our Fall Brunch at the Four Seasons Atlanta was a breeze. What I love about Fall fashion is the versatility. The weather can be warm one minute and get cooler the next. Layering helps you to be prepared for both. I pulled together some of my favorite Fall pieces to layer into one sophisticated look for brunch. I wore a beautifully detailed lace dress, that had pops of color on a sleek black base. The belted waist added another dimension to the dress that I loved. I layered it with a rich, velvet blazer. Blazers are the perfect layering piece. They can be worn with just about everything or draped over the shoulders for the look of fall without being too heavy. My Balenciaga boots really elevated this look even more. Let’s talk about high-low fashion for a sec… My dress cost $90, and my boots were significantly more. A great dress is still a great dress, no matter the price tag. With the right mix of pieces, you can make the look fit into any luxurious venue or car. My boots were a great choice. They added sophistication to a look that was also fun. I stayed on the high-end with my classic Chanel bag. You just can’t get any more luxurious than Chanel. It works well with both high and low-end pieces. Nothing screams classic, sophistication like a classic Chanel 2.5 flap bag. My other accessories finished the look by speaking more to my personality. My gold layering necklaces and Chloe heart-shaped sunglasses complement the ritzy look, but also add a trendy feel to my chic, sophisticated, and fun outfit. It was the perfect Fall fashion blend. I had an amazing time. I’m am already looking forward to the next Fall Brunch. Great food, great style, and great conversation made for the perfect day away. How do you take time away for yourself? Get exclusive access to giveaways, style tips, sale alerts, and all the season's must-haves!